Europe continue to snub their nose at their past or first half of their history with their latest studio album Walk The Earth. Gone are the magical melodies and sing along choruses. In are the Jon Lord organ filled and Deep Purple influenced more “mature” and complex sounding songs. The only remnants it seems from Europe‘s first half of their career are the still amazing voice from lead vocalist Joey Tempest and the line-up remaining virtually intact with the only exception that Jon Norum has come back and taken over from Kee Marcello. 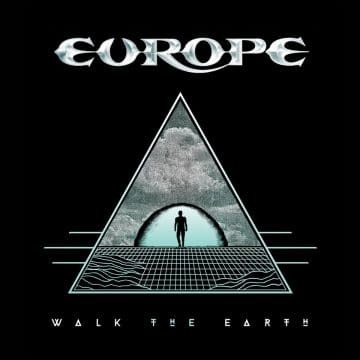 I must say that I had high hopes for Europe‘s latest studio album after listening to the first single “Walk The Earth” given that although the track was once again quite different from the Europe of the ’80s, it had a magical feel to it and really built slowly but strongly. Unfortunately, the rest of the songs on Walk The Earth do not even come close to the title track both in terms of melodies and memorable hooks of any kind. I would have never thought that I would prefer War Of Kings over Walk The Earth but there isn’t a whole lot to get excited about with Europe‘s latest studio album. Half the songs on Walk The Earth sound like filler material and at times remind me of when Alice Cooper was bottoming out aimlessly in the late ’70s and early ’80s with some terrible experimentation (fuelled in large part by his alcohol and drug addictions). “Wolves” is an excellent example of Europe experimenting with an almost atmospheric like tune, which is borderline awful. There are only a handful of tracks that are really worth listening to on Walk The Earth consisting of the title track, the peppier and more melodic “GTO” and the closest sounding song to older Europe material — “Whenever You’re Ready.” Funny enough, out of the first five songs, only the title track is worth listening to with the four others really lacking in melodies and bordering on quite dull. It’s not often that an album is a lot stronger during its second half but that’s exactly the case for Walk The Earth with songs seven to ten seemingly rocking a little more and laying off on the keyboards/Hammond organ dominance. Now before you think that I am just bashing Europe, I must emphasize that they have come up with some good to great stuff since reuniting back in 2003 including Start From The Dark, Secret Society and especially Last Look At Eden. Bag Of Bones was alright but it’s really with War Of Kings that Europe started to stray a little too far and they have taken it unfortunately even further with Walk The Earth. Overall, Walk The Earth represents a second disappointing album in a row from Europe. Hopefully, they’ll decide one day to go back to their ’80s glory sound or at least get back to songs in the vein of Last Look At Eden. The official video for ‘Walk The Earth’ from the upcoming new album “Walk The Earth” out on the 20th October 2017. Buy it here: http://hyperurl.co/q1ew1l Preorder the new album and receive ‘Walk The Earth’ as an immediate download.